Shoppers may be willing to pay a 15 to 56 percent premium for palm oil produced without the destruction endangered species’ habitat, asserts a study published today in the Proceedings of the National Academy of Sciences. Orangutan orphaned after its mother was killed in an oil palm plantation. Photos by Rhett A. Butler. The research, conducted by an international team of scientists led by Ian Bateman of the University of East Anglia, is based on consumer surveys and analysis of the cost of conserving wildlife habitat within oil palm concessions in Sumatra. It found that the cost of conserving critical habitat could be more than offset by the price premium shoppers claim they would be willing pay for wildlife-friendly palm oil. Destruction of protected elephant habitat in Indonesia’s Tesso Nilo National Park for palm oil production in June 2015. The paper asserts that a 15 percent premium could drive a 32,000 hectare palm plantation to conserve up to 6,000 ha of wildlife habitat. However whether that proves to be the case in practice is another story. Major consumer products companies refuse to pay a premium for palm oil certified under the Roundtable on Sustainable Palm Oil (RSPO), the sector’s leading certification standard. While RSPO-certification doesn’t necessarily translate to wildlife-friendly, since the standard still allows conversion of rainforests and peatlands to industrial monoculture plantations, it nonetheless remains the best proxy of the market for greener palm oil. The current lack of a meaningful price premium for certified palm oil suggests that consumers will need to directly demand — and demonstrate a clear willingness to pay for — ‘conservation grade’ palm oil to convince food and cosmetics companies that is it worth their while to spend more money on the commodity. Forest freshly destroyed for an oil palm plantation in the Leuser ecosystem, an area that is home to endangered orangutans, tigers, rhinos, and elephants. The trend of late has actually been to shift emphasis away from certification toward valued-based “deforestation-free” commitments. But no one has yet developed a way to pay for those — instead those policies are rooted mostly in companies’ fear of public shaming or the personal convictions of their owners. Indeed, a positive market incentive for conservation could ultimately push slow-moving companies toward greener practices. Like what we do? Help us do more! And you can follow us on Facebook or Twitter. But by far the best way to stay up to date is to subscribe to our newsletter. Get all the latest news in your inbox in our fantastic bi-monthly newsletter, and the occasional additional special update on campaigns and events. 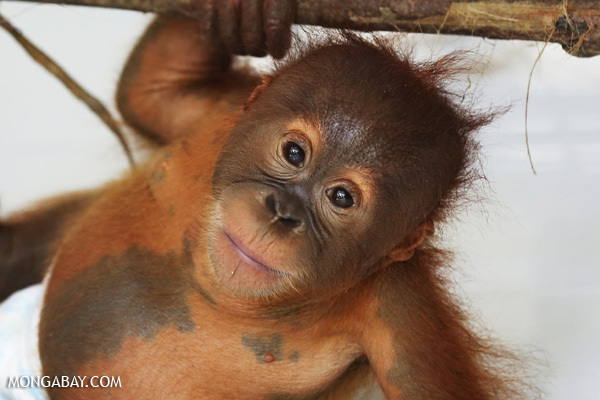 No Comments to "Consumers willing to pay sharp premium for wildlife-friendly palm oil, claims study"